As awareness of Open Educational Resources grows and enters mainstream use, mainstream education technologists are beginning to explore their potential, and this is good news for OER enthusiasts. As people who build technology appreciate the value and inherent qualities of openly licensed content, I predict that they will start to solve many of the technical issues OER have faced for the first 15 years of their formal existence – particularly around search and discovery. Amazon’s recent interest in OER, for example, is symptomatic of OER gaining mainstream attention and adoption. Vivek Ragavan, a technologist in Silicon Valley, recently explained to me the simple framework that describes the necessary components of any successful education technology venture. 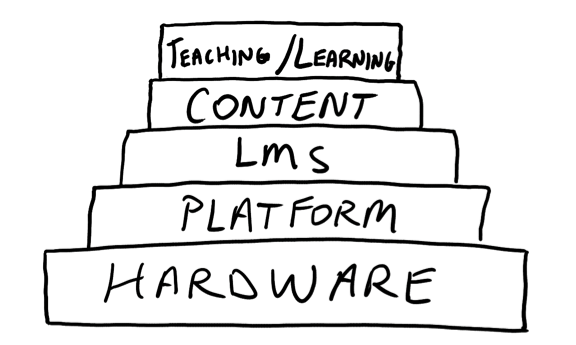 Ragavan’s edtech framework looks like a pyramid, with hardware at the bottom, layered under a platform, layered under a learning management system, layered under content, layered under teaching and learning. In general, the direction of influence in this framework is upward: Hardware affects the capabilities of platforms, which themselves affect the capabilities of LMS’s. Content can be affected by all three of the bottom layers, but need not be. However, education technologists operate under the basic assumption that when content is appropriately affected by technology, teaching and learning can be improved. 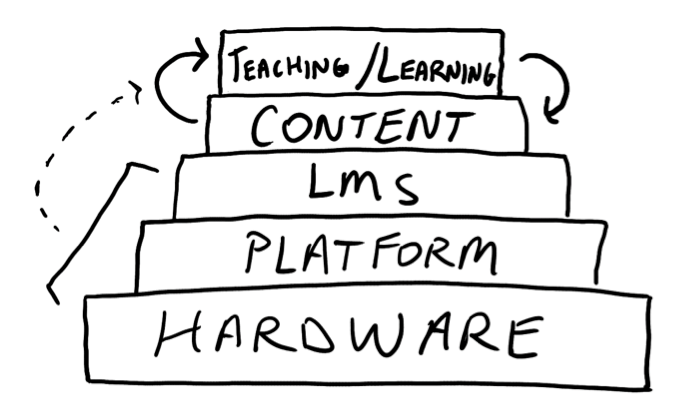 I may be oversimplifying a bit, but I believe that most education technologists pay the heaviest attention to the bottom three layers of this framework, with occasional attention to the content layer. Attention to actual teaching and learning is rare. People in the OER field, on the other hand, have long paid special attention to the content layer, and have either built off existing elements in the bottom three layers or built their own technologies. Technologists interested in OER have also spent considerable time working to improve foundational technology to make OER easier to find and use in effective ways, although this technical work has been fragmented and fairly disconnected on the whole. The real potential for OER to improve education is in its open license. In contrast to ‘all rights reserved’ copyright, OER are licensed to allow anyone, anywhere, anytime to reuse, repurpose and redistribute the content…Using the full potential of OER by intentionally leveraging the open licenses is called open educational practice (OEP, or sometimes Open Pedagogy). In this article, I went on to describe several examples of open pedagogy, including David Wiley’s Project Management for Instructional Design (PM4ID) project and the work of the Wiki Education Foundation to promote editing of Wikipedia by students in academic contexts. Looking at these examples using Vivek’s framework is useful. In the PM4ID example, Wiley began with open content (an openly licensed Project Management textbook) and leveraged common hardware (institutional and personal computers) and software (Word, WordPress, etc.) to engage his students in adapting a textbook to better fit the course outcomes. Similarly, the Wiki Education Foundation began with openly licensed content (Wikipedia articles) and leveraged a particular platform (Wiki-editor) and common hardware (institutional and personal computers) to engage students in editing and improving Wikipedia. In both of these examples, two important things occurred: (1) students engaged in personal, authentic learning experiences, and (2) students and educators improved existing content, adding real value back to the real world. In the Ragavan Framework, openly licensed content facilitated unique teaching and learning practices, which, in turn, improved the open content itself. The entire process was itself facilitated by technology. When content is openly licensed and the open license is fully leveraged by teachers and students, it becomes much safer to assume that technology will improve teaching and learning. While OER will continue to move into the mainstream, Open Educational Practice is just being born. In 20 years from now, I predict that students of all ages throughout the world will be engaging authentically with open educational content, in ways that simultaneously improve their learning and the content they are learning with. I also predict that we will know a lot more about the impact of open educational practice on student learning, which will further drive OEP into mainstream practice. For this prediction to become prophesy, however, education technologists within and without the OER movement need to start seizing the opportunity that OER and OEP offer for achieving the basic goal of all education technology: Real and sustained improvement in teaching and learning. This work by TJ Bliss is licensed under a Creative Commons Attribution 4.0 International License.